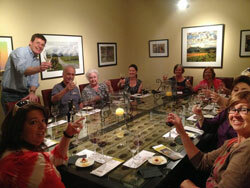 Local Roots Food Tours was developed in 2010 with a simple concept: I wanted to share my passion for the great local cuisine found in the Sacramento area. After participating in several food tours across the nation, my husband and I realized that many of the dishes being offered consisted of ingredients from our own Sacramento Valley. As a gardener and a chef, I wanted to highlight the farm fresh food and inspiration of our local chefs -- so I researched restaurants offering local food and the history of some of the oldest neighborhoods in Sacramento. Our first tour was the "Origins of Sacramento," a walking tour that ventures into Midtown's Sutter District and East Sacramento's Fabulous Forties. The tour showcases restaurants that provide authentic tastes from the diverse groups that forged our great city and created its agricultural dominance. I hand-select the establishments that have rich California history and support local farms by using fresh fruit, produce and meats. Last March we launched a tour in nearby Murphys, California. Aptly named the "Queen of the Sierras," the old mining town of Murphys is the perfect destination for a food and wine tour. Another new tour is the "Gourmet on K Culinary Walking Tour," which shows participants everything gourmet along one of Sacramento's most historic streets. Folks are guided down the city's original main street, exploring the beautiful architecture with many stories dating back to the 1800s. Locals and tourists alike enjoy this culinary excursion as it enlightens their views of the most controversial street in the city. More tours are on the way. And, for those interested in more information on local food and history, my Local Roots blog is updated daily with recipes, events and coverage of Northern California "foodie" news. Along with the tours, this virtual table provides another opportunity to connect with fellow food enthusiasts, fostering that most intangible -- yet valuable -- result: a sense of community, right here in Sacramento. 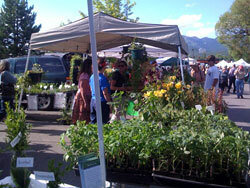 You can also visit our Facebook page or find us on Twitter @LocalRootsFood. Chef Tylun Pang on "What Maui Likes to Eat"
Maui food. I only have to say the words and your mouth begins to water thinking of all the fresh products -- from local fish to Maui onions -- available on the island, doesn't it? Obviously, the best way to get Maui food is to, well, go to Maui -- and enjoy it yourself at one of island's many food outlets, which range from local stands to fine dining restaurants (some of which were featured in our story "Celebrating Agricultural Abundance on the Island of Maui"). A new one to add to the list is Ko at the Fairmont Kea Lani, Maui, which translates to "sugar cane" in Hawaiian, and celebrates both the agricultural abundance of the island and the mix of cultures that came together during the plantation era. 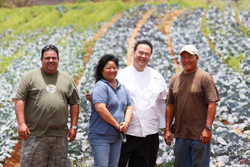 Even better, Ko's executive chef, Tylun Pang (pictured above at Otani Farms), sources 90 percent of his produce from regional farms, including Hali'imaile Farms, Escobedo Farms, Kula Farms, Keaau Farms, Evonuk Farms, CN Farms, Allen Nago Farms, Anuhea Farms, Kamuela Farms, Shishido Farms, Pacific Produce and Island Paradise Farms. As Chef Pang says, "Listening to the farmers and fishermen and their stories helps me understand what they produce and what's being caught. I can then use my knowledge and training to take the flavors to the next level." For those who'd like to bring some of those flavors home, Chef Pang has a book called "What Maui Likes to Eat" (click on the Amazon link on the right if you'd like to order) that is filled with recipes and stories from the island. 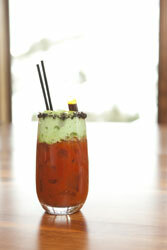 Even better, 100 percent of the sales from the book are donated to the local culinary academy on Maui. And, Chef Pang was kind enough to share one of his signature recipes with us. See below for his Kobe Beef Poke, which uses island favorites such as Kula onion, Maui raw sugar, Hawaiian alaea salt and Japanese cucumber. Enjoy! While champagne is nice for celebrations, in my mind nothing says love like a good red wine - especially a good pinot noir. For Valentine's Day this year, Jeff and I will be enjoying the Oppenlander Vineyard Pinot Noir from my friend Toby Hill's Phillips Hill Winery, which makes limited edition pinot noirs from the Anderson Valley and Comptche up in Mendocino. 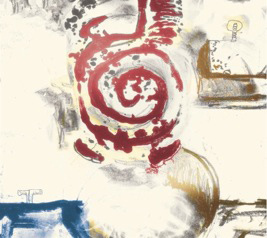 Artwork on the label for the Oppenlander (pictured right) is also Toby's. For those looking for an excuse to make the trek to Mendocino, this summer Phillips Hill will be holding a farm-to-table winemakers dinner, held in a field atop Mendocino Ridge overlooking the Anderson Valley. 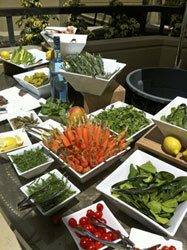 All the food will be sourced from local farms and ranches and prepared by a guest celebrity chef to match the wines. Phillips Hill limited edition wine club members will be the first ones notified of the final details for the dinner. 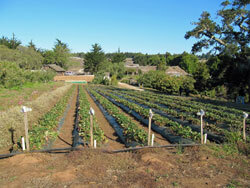 For more information, call 707-877-1151 or visit PhillipsHillEstates.com. And with that, I bid you a very Happy Valentine's Day!